Chepito is full of questions. Why is his mother cooking eggs and frying beans? Why is Manuel digging around the corn? Why is Ramon milking the cow? Why is Maria slapping dough between her hands? In this simply told story, a little boy learns all about food and where it comes from. Following on the success of What Are You Doing? 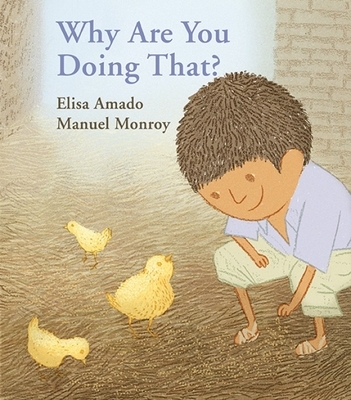 Elisa Amado and Manuel Monroy have created another gem of a picture book, this time about food where it comes from, how we nurture food plants and animals, and what we eat to be healthy and strong. Manuel Monroy sweetly depicts Chepito's world a rural community where people grow much of their own food and raise chickens and cows giving young children a clear picture of the origins of foods they consume every day. Includes a short glossary. Elisa Amado is a Guatemalan-born author and translator. Her books have been on the Americas Award Commended List and on USBBY s Outstanding International Books List. She lives in Toronto. Manuel Monroy is one of Mexico s most accomplished, award-winning illustrators whose work has appeared in children s books, in magazines, on posters, and most recently in animation projects. He has also exhibited his art in Mexico, Cuba, the Czech Republic, Italy, Japan and the Netherlands."